Disney has recently revolutionized their ticketing system with the introduction of FastPass+. Gone are the days of paper FastPasses distributed throughout the parks at specific intervals of the day. This new technologically-savvy system is available to vacationers staying at on-site resorts, and comes with a new set of pros and cons to consider when buying tickets. There are still alternatives to the FastPass+ system, should you decide to opt for something a little more traditional. You can check out Disney’s website for information on single day or ‘Park Hopper’ packages. If you are staying on Disney property and you decide against the traditional tickets, you are eligible to test out the new FastPass+ system. Rather than receiving a room key with your tickets pre-programmed, you will be given a Magic Band (pictured above). These come in many colors, and feature a Mickey head on the front that will become your virtual “ticket” once you reach the park. You can even have your name inscribed on the inside! The idea behind FastPass+ is to use mobile apps or kiosk stations in order to book attraction and show times months in advance. Once you book your room, you can begin reserving FastPass+ times up to six months before your trip. If you choose to wait until your arrival, you can reserve times the day of your trip, though times might be very limited. 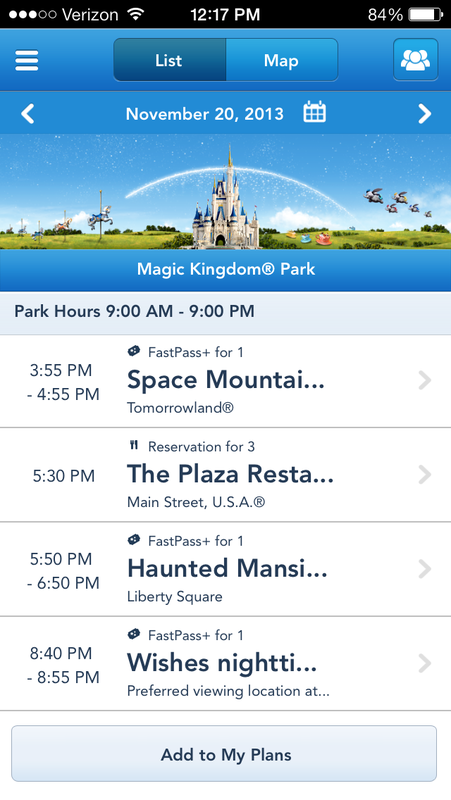 The FastPass+ system also allows you to keep your reserved times in one convenient location through the MyDisneyExperience app. This screenshot of the MyDisneyExperience app taken during my vacation last year has all of my reservations grouped together by date. Through this new system, you can store FastPass+ times for both attractions and shows, as well as any dining reservations you may have made. This makes planning your vacation easier than ever before, and it is especially convenient that you can change this information at any time during your trip. One of the coolest features of this new system is the opportunity to reserve times for parades and special nighttime shows. While vacationers would previously start gathering for the fireworks hours before the actual show, FastPass+ allows you to reserve seating or standing room in a viewing area. This means that you would only have to show up to a designated area twenty or thirty minutes before a show begins and still be guaranteed a good view. FastPass+ includes reservations for all of the most popular shows, including Wishes, IllumiNations, and Fantasmic!. There are a few notable downsides to this new system, starting with the fact that it is still in testing stages. While touching the Mickey head on your Magic Band to the Mickey head on the new turnstile is extremely easy, it’s not without its kinks, and is certainly not at 100% functionality just yet. Still, the system is remarkably reliable for its young age, and you shouldn’t find too many problems with it. 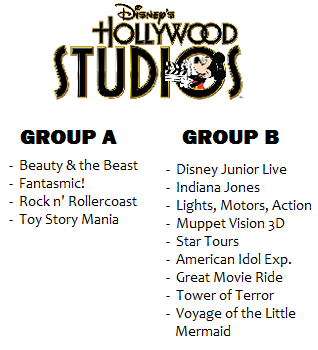 With these tiered systems in place, you can only choose 1 attraction/show from Group A, and 2 attractions/shows from Group B. So far, FastPass+ reservations are not tiered for Magic Kingdom or Animal Kingdom. 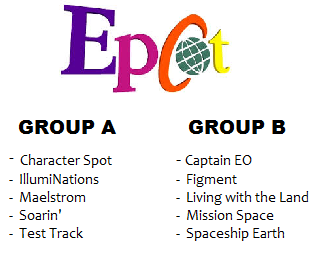 You should be aware, however, that your choices for Epcot and Hollywood Studios can be limited. While the new FastPass+ system has received mixed reviews, I have personally found it to be an improvement on the old system. I will miss paper FastPasses as much as every long-time Disney vacationer, but I think these new features more than make up for that loss. The convenience of the MyDisneyExperience app cannot be overstated, nor can the ease of updating your reservations should you need to make a last-minute change. If you are skeptical of this new system, I encourage you to check out Disney’s FAQ for more information, and consider trying it out yourself.